I always think that moms are the hardest to shop for. My mom, particularly, knows what she likes and what she doesn't, which is a good thing...until you're the one that has to buy a gift for her. So, my mom gave me the idea of collaborating on a gift guide for moms. These items are coming straight from her wishlist or are things she already has. So, if your mom is chic and stylish like mine, she will love anything on this guide. We have gifts for every price point, from free (see #6) to $120. Also, I'm sure your dad will be extremely grateful if you send him this post! 1: Kate Spade Initial Necklace- My dad got this adorable necklace for my mom last year. It says "one in a million" on the back, which is so fitting for every mother. She wears it almost every day-- it's great for layering! 3: New Balance Sneakers- My mom wears her black and white Newbies for running errands, going to our sporting events, shopping, and everything in between. 4: Jo Malone Set- This is at the top of my mom's list this year. She wears one type of Jo Malone perfume daily but says she is so excited to try the other scents. 5: Kendra Scott Aiden Necklace- Another item my mom is asking for this year. She always styles long necklaces with sweaters or a cardigan and t-shirt. 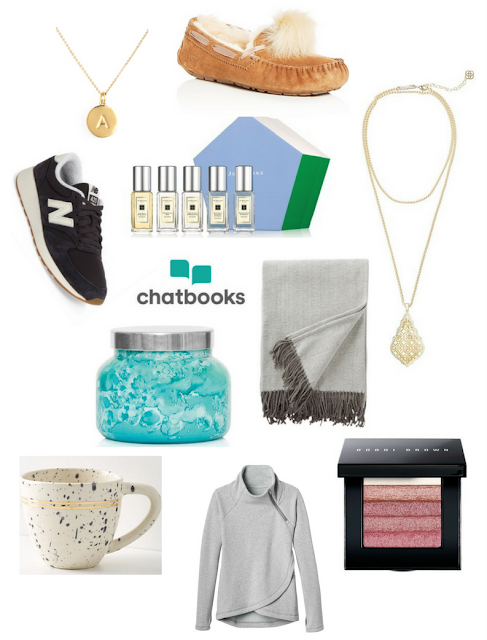 6: Chatbook- For Mother's Day last year, I ordered a book from the Chatbook app. It was a collection of pictures off of my phone of my mom and her kids over the years, and she loved it! It only took about twenty minutes to make and you can choose pictures from your camera roll or get a book of your mom's Instagram. Follow this link to get your first book FREE, and order by December 16th to get it in time for Christmas! 7: Volcano Candle- I feel like this candle is our house's signature scent, we burn it so much. It's so pretty, too, so you can't go wrong. This gift is nice because it is inexpensive but will last a long time. 8: Herringbone Throw- My mom likes to switch out different blankets on top of her white duvet, so I know she would love this herringbone throw. 9: Anthropologie Mug- As a daily coffee drinker, she loves cute mugs. This one is adorable! 11: Bobbi Brown Shimmer Brick- She uses this in her daily makeup routine. I have used it before and it is kind of like a blush/highlighter hybrid! 14 more sleeps till Christmas! Awsome blog!Made me read till the end .I completely agree that to shop for mom is the hardest thing one can come through in his/her life.Well,apart from that I would say that this blog was very informative and lovely also.